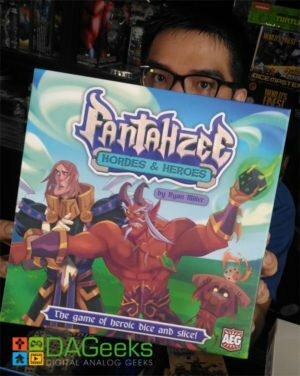 Me and Haoson were able to get the chance to play test Fantahzee, a game from AEG that came from the GenCon 2016 haul of Neutral Grounds Philippines. 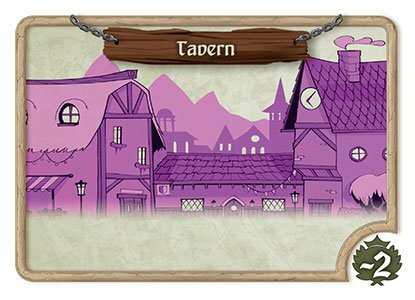 These are the cards that players will be using to defend the town. On each card their respective strength is displayed on the upper left corner while on the upper right is the type of hero they are. Next thing to see is the name of the card with the corresponding image underneath. On the bottom of the card is the ability of the card and the activation cost. Activation costs vary from a specific dice roll, to any group of the same face, or to steam cost(found only on artificer cards). 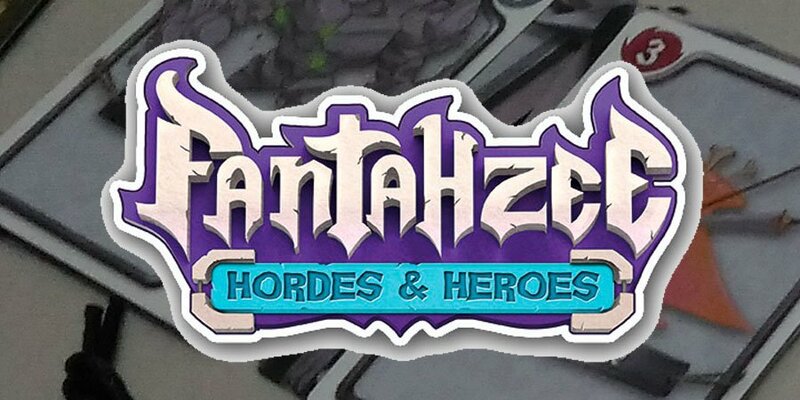 There are also 3 types of heroes in this game, and they are called the Magicians denoted by a fireball, Artificers denoted by a anvil and hammer, and the Soldiers denoted by a sword, each with their own specific theme. 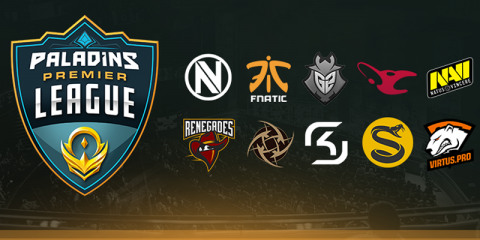 These cards are the ones players will be defeating through out the game. They share the same layout as the Hero cards with the strength in the upper left, card type on upper right, and the ability in the center, but with 2 additional icons at the bottom corners. Some monster cards will have a Treasure chest icon or 2 marked on the bottom left, what this means is that if this monster is defeated the player may draw a card from the treasure stack and use the corresponding marked side, so if you defeated a monster with 1 treasure chest icon, you may only use the side with 1 treasure chest, and same goes for the 2 treasure chest icon. 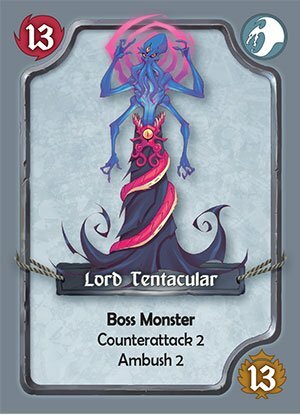 On the bottom right of the card marked with a leaf with numbers in it is the Victory points earned when the monster is defeated. These are the cards used to power up your heroes. 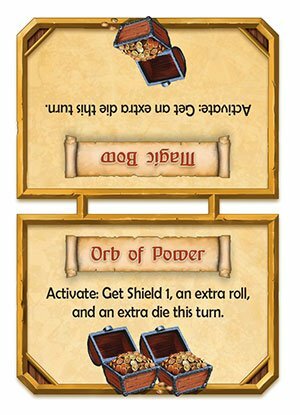 The card is divided into 2, one side marked with 1 treasure chest, and the other side marked with 2 treasure chests both with abilities to help the players defeat more monsters. As a player you want to avoid getting these cards into your pile as they only bring negative points, along with some abilities like making you discard your treasure card. The game is comprised of 4 types of cards, Monsters, Heroes & actions (I will be referring to this stack as Hero cards), Treasure, and last but not least the village. The game is easy to setup with 5 horde stacks comprised of 1 boss monster each, level 2 monsters and level 1 monsters on top. Next to them is the facedown stack of village cards. On the side we have the Treasure and Hero cards for the players to use. 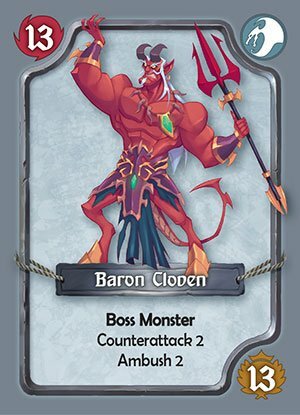 The game starts of each player with a hand of 5 cards drawn from the Hero stack, and randomly determine the last player. 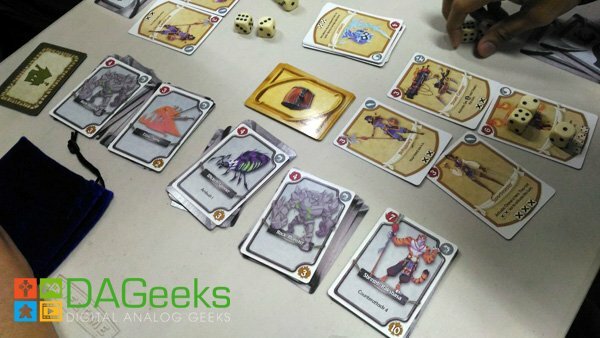 On their turns each player can play up to 2 Hero cards, and 2 Action cards from their hands. 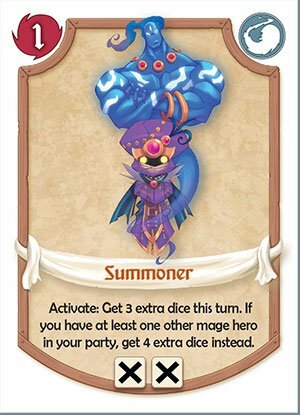 Once the cards have been played players take 5 dice and roll them with the hopes that they match the activation costs on your card so that you can use them in battle. After the first roll you may keep some of the dice or use some of them to activate a card, once you have set aside some dice you can take the rest and re-roll them and repeat the process, the game allows for only two re-rolls. Unless you have cards that allow you to have more. You chance to attack the monsters happens after this process. 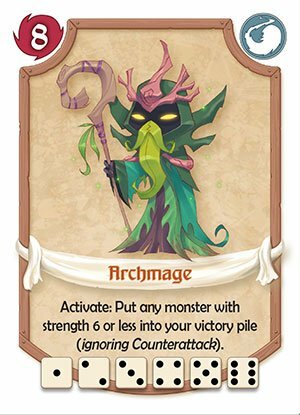 The total of the activated heroes’ strength will determine your overall attack power. This allows you to defeat as many monsters as long as your total strength can pay for it. Whenever a monster is defeated we check if it has a Counterattack ability. Counterattack damage is easily calculated with counterattack number – the Shield a player has acquired with the rest dealt to the party. 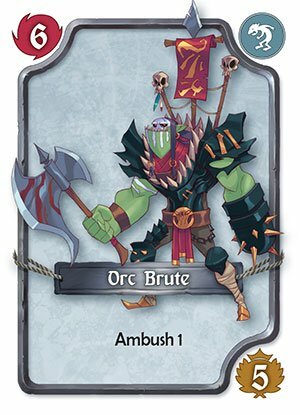 After you are done attacking the horde if the monster next to the village is not defeated, then the active player will draw the top village card into his victory pile as penalty, At the end of the turn we total any ambush abilities and deal the damage – shield to the party once more. The turn is passed on to the next player, and play continues until 3 boss monsters have been defeated or the village stack is gone. If the village stack is depleted then all players lose, if the bosses are defeated then players count the victory pile, with the highest points winning the game. I’m no stranger to the Yahtzee mechanic since I’ve also played King of Tokyo, and King of New York, and didn’t have much trouble getting into the game, though we had trouble understanding the rules at first, but any questions we had were answered in the rules or in the FAQs section of the rule book. I really enjoyed the game especially when making combos getting all your heroes activated with only the starting 5 dice. I loved how each hero type is very different but play off each other so well. Each hero type having their own theme with the Mages focusing on getting more dice, dice rolls, and changing dice rolls, while the Artificers focus more on their giant steam golems which can run off steam so you only need to focus on generating that steam through the dwarves, while the Soldiers focus on reducing the activation cost of other cards. 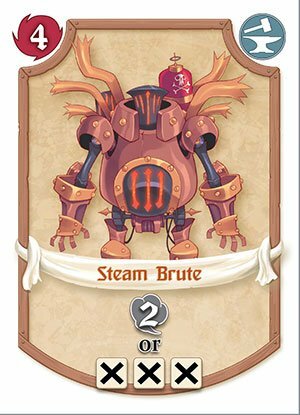 The card artwork on the cards are awesome, especially the Steamsaurus. The game is fun and has that feeling of suspense because of the randomly shuffled level 2 monsters. You’re never sure what may come out and wreck your whole party, and make you start from scratch. I have to admit there is a chance that a player may steamroll, because of the randomness, but it is also because of that randomness he could lose badly the next game. It is because of that, that I feel the game is balanced, at least as much as a dice rolling game can be. There was this time during a game where I had a summoner and alchemist in play, which gave me 6 extra dice and an extra re-roll, so in total rolling 11 dice. I had already locked in 4 of my dice leaving me with 7 to use, and all I needed was to roll one 2. I didn’t get it and half my party was destroyed. I thought that was it for me “I’m coming in last”, but I continued on slowly building my party back up. Long story short I had good plays and combos, and came in third among all of 4 of us. 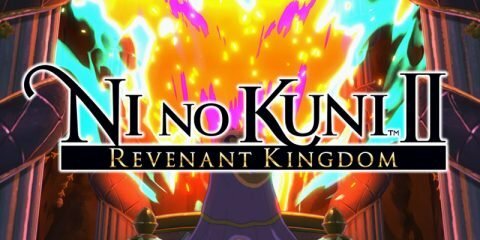 So taking everything into account I would say this is one game I’m going to buy once it hits store shelves here in the Philippines. We’d like to thank Neutral Grounds Philippines for allowing us to play with their copy!